...but it's also a sure way to attract more birds as well. On our last antiquing trip, we bought this vintage bird bath, but the birds have yet to discover it. 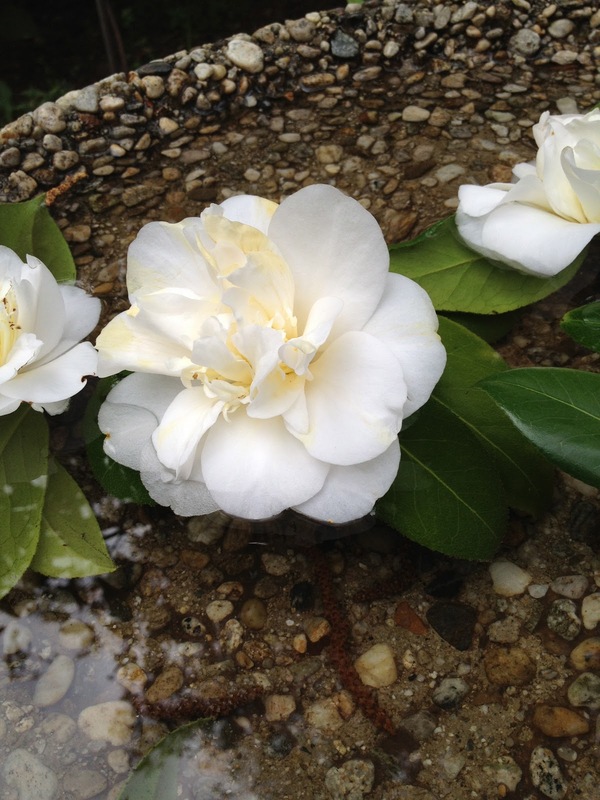 In the meantime, I picked white camellias to float in it. I love how this is a one of a kind piece, hand made by someone who thought to stud it with pebbles. I found the perfect place for it in the garden amongst the lilac and azaleas. In the front yard, the fountain that doubles as a bird bath is a great source of entertainment. That's because the birds have a field day playing in it! If you haven't noticed, this week is gardening week. Pruning and planting, fertilizing and futzing around in the dirt. All this to stay out of the house while the painting contractors work their magic on the kitchen cabinets. It's a green world inside and out around here! this is to die for! have to add this to my list. I'm loving the garden posts. I'm smitten with your new little pebble bird bath. It's adorable. I'm sure the birds will find it soon enough and they will love it too. Delores what a glorious setting. I love outdoor living this time of year! ....I wanted you to know...I am featuring Anita Rivera, Friend, Designer and Paper Artist with Castles Crowns & Cottages on my site! Beautiful. I love watching the birds splashing around in our bird bath. It is quite entertaining. Beautiful features and that little bird is so cute. 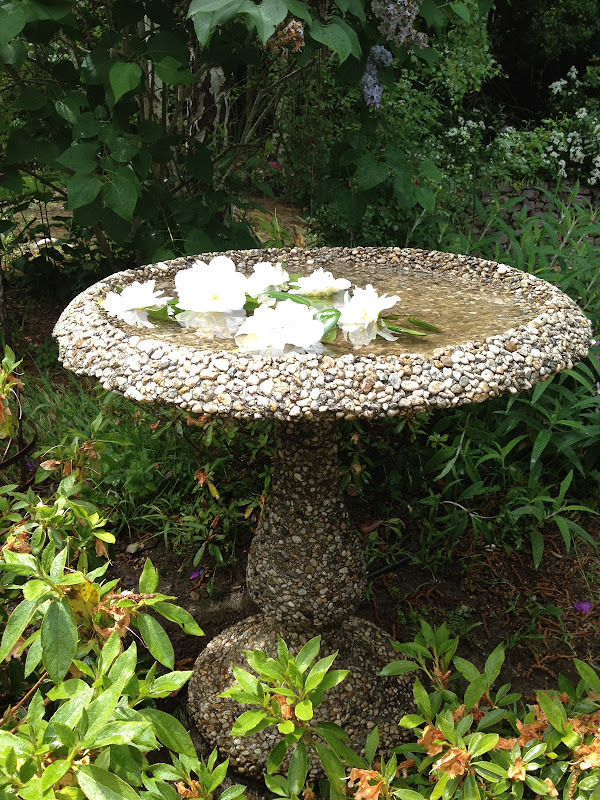 I have a stone fountain made out of a French animal trough...love to see little birds drinking from there. I am more relaxed already having seen this beautiful post, I agree water in the garden is very peaceful and makes me feel so relaxed. Little birds just add to the charm....beautiful! These images make me wish I were in my garden instead of behind a desk...I live for weekends! Thanks for sharing, your fountains and bird bath are lovely. Just so beautiful, hearing the trickling sounds of water and seeing the birds. Nothing better than 'water sounds' ion the garden. We have a fountain on the side of the house and it is one of my favorite places to sit and relax. 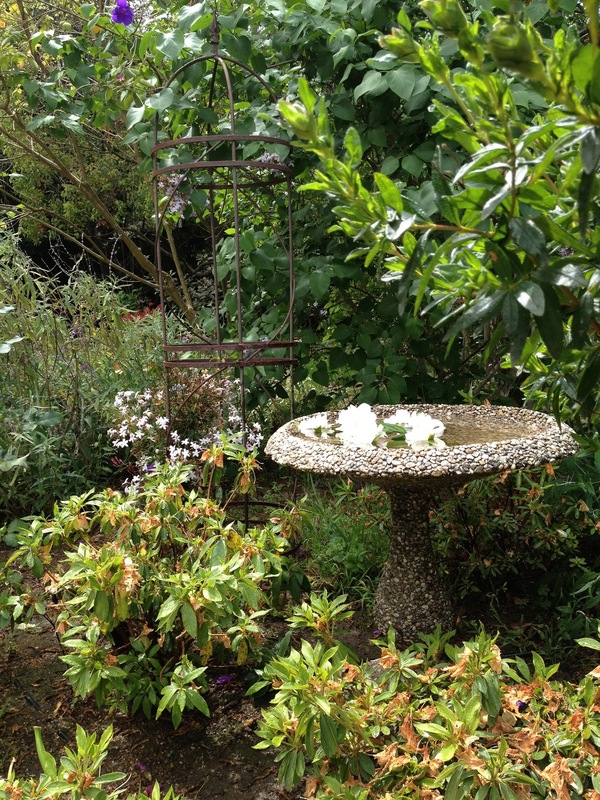 I bought my Victorian birdbath many years ago (probably shouldn't have as the kids were in college!) Oh well, it has continued to bring us great joy as it is a real statement in the garden and the birds love it! They will soon find yours and have a ball splashing away this summer~ darling post. We have two fountains in two different gardens. You're right, the sound of the bubbling water is so soothing, and birds really do enjoy them as a place to bathe and drink. They're all such simple pleasures that require QUIET to enjoy! There is nothing more soothing than the look and sounds of water in the garden...beautiful gardens!! They are so beautiful and that is a great capture of the bird enjoying his splash in the bath. Enjoyed it. There is something very relaxing about the sound of water in the garden. Your garden is stunning. 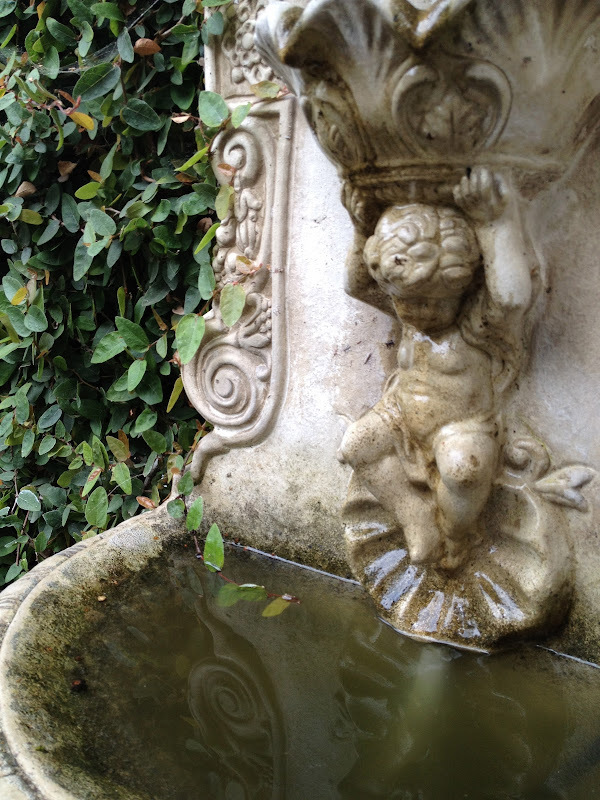 The birds always seem to find fountains & water features & it is interesting to watch them enjoy the water! Wonderful garden pics, Delores. Your new bird bath is charming. Out in my garden these days too. We have a lot of robins use are water features at work. I have not managed to get a picture but I dont link my phones camera would manage to capture the beauty of the several robins playing in the water features.